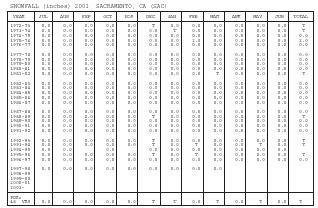 Sacramento, and the lower Sacramento Valley, has a mild climate with abundant sunshine most of the year. A nearly cloud–free sky prevails throughout the summer months, and in much of the spring and fall. 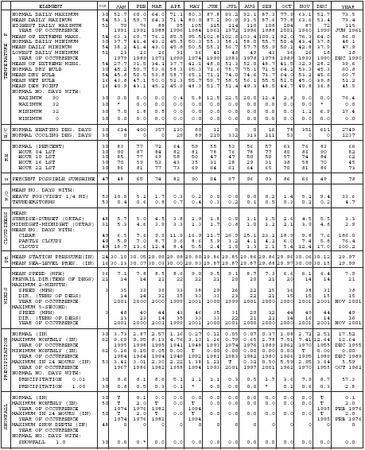 The summers are usually dry with warm to hot afternoons and mostly mild nights. The rainy season generally is November through March. About 75 percent of the annual precipitation occurs then, but measurable rain falls only on an average of nine days per month during that period. The shielding effect of mountains to the north, east, and west usually modifies winter storms. The Sierra Nevada snow fields, only 70 miles east of Sacramento, usually provide an adequate water supply during the dry season, and an important recreational area in winter. 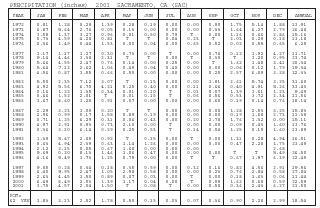 Heavy snowfall and torrential rains frequently fall on the western Sierra slopes, and may produce flood conditions along the Sacramento River and its tributaries. In the valley, however, excessive rainfall as well as damaging winds are rare. 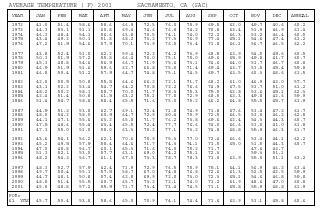 The prevailing wind at Sacramento is southerly every month but November, when it is northerly. Topographic effects, the north–south alignment of the valley, the coast range, and the Sierra Nevada strongly influence the wind flow in the valley. 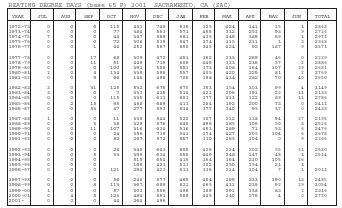 A sea level gap in the coast range permits cool, oceanic air to flow, occasionally, into the valley during the summer season with a marked lowering of temperature through the Sacramento–San Joaquin River Delta to the capital. In the spring and fall, a large north–to–south pressure gradient develops over the northern part of the state. Air flowing over the Siskiyou mountains to the north warms and dries as it descends to the valley floor. This gusty, blustery north wind is a local variation of the chinook. It apparently carries a form of pollen which may cause allergic responses by susceptible individuals. As is well known, relative humidity has a marked influence on the reactions of plants and animals to temperature. The extremely low relative humidity that ordinarily accompanies high temperatures in this valley should be considered when comparing temperatures here with those of cities in more humid regions. The extreme hot spells, with temperatures exceeding 100 degrees, are usually caused by air flow from a sub–tropical high pressure area that brings light to nearly calm winds and humidities below 20 percent. Thunderstorms are few in number, usually mild in character, and occur mainly in the spring. An occasional thunderstorm may drift over the valley from the Sierra Nevada in the summer. Snow falls so rarely, and in such small amounts, that its occurrence may be disregarded as a climatic feature. Heavy fog occurs mostly in midwinter, never in summer, and seldom in spring or autumn. An occasional winter fog, under stagnant atmospheric conditions, may continue for several days. Light and moderate fogs are more frequent, and may come anytime during the wet, cold season. The fog is the radiational cooling type, and is usually confined to the early morning hours. Sacramento is the geographical center of the great interior valley of California that reaches from Red Bluff in the north to Bakersville in the south. This predominantly agricultural region produces an extremely wide and abundant variety of fruits, grains, and vegetables ranging from the semi–tropical to the hardier varieties. 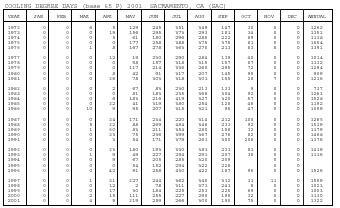 Based on the 1951–1980 period, the average first occurrence of 32 degrees Fahrenheit in the fall is December 1 and the average last occurrence in the spring is February 14.